The team at Ski Japan Junior Training Academy (SJTA) are motivated by the evolution of the competitive ski and board scene. We believe that challenging the next generation of athlete is the key. Our success with this passion has come from developing progressive camps that are fun, safe and challenging in specific disciplines such as GS, Moguls, Skier/Boardercross and Slopestyle. Now entering its 6th year of operation the purpose of these camps is to prepare aspiring junior skiers/boarders aged 7 – 18 years for success at Interschools & SSA competitions. We organise structured 5 & 6 day camps that run from December to April. Each camp is run by the professional team at Niseko Base Snowsports and is designed to encompass all aspects of ski and snowboard competition. Whilst the main base of operations is Niseko we assess the daily conditions and select from a number of local resorts including Niseko, Moiwa, Rusutsu & Kiroro. We can customise special programs for school groups. SkiJapan.com can organise fully inclusive packages, airfares, ski rental & other activities for the family can be arranged (ski-in/ski-out accommodation). SJTA is an excellent training environment for our Snowsports athletes to hone their competitive skills in the best snow in the world. SJTA coaching staff are professional and very friendly. 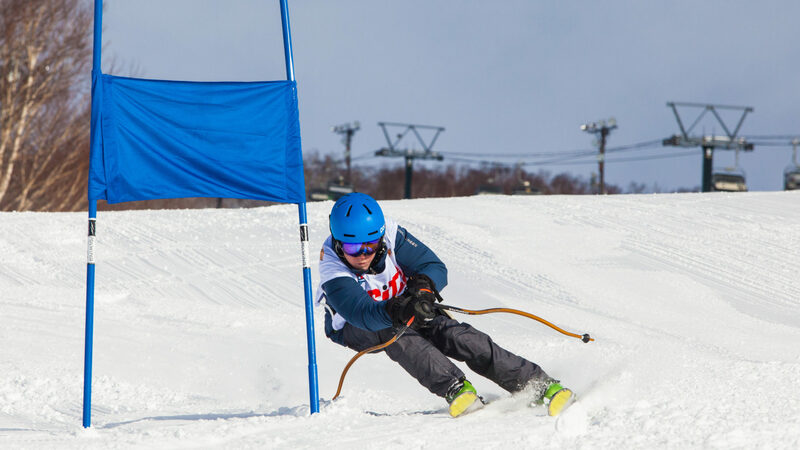 We found the SJTA program’s balance of fun and serious training perfect for our Snowsports team and helped us gain a competitive edge at Interschools; these experiences for our kids in Japan are priceless. We feel so blessed to have had such an amazing week with you guys! The instructors were top notch - Matt and Jens were fabulous with the kids! Really nice guys! Please note that the course outline provided is a guideline and may change at any point. In the event that the snow conditions are not conducive to gate training, the program may be amended to include competition specific drills/exercise. It is also likely that the coaches may choose other local ski areas for training in the hope to find the best snow conditions. This will be communicated daily as the weather/snow conditions are assessed. * By participating in the training offered by NBS, the customer, parent or guardian understands that snow sports can be dangerous and may result in injuries. NBS will not be held liable for any injuries or accidents occurring before, during or after the service has taken place. NBS is not liable for any equipment that is lost or damaged during this training. This includes any replacement costs or lost training time. NBS requires every participant to follow instruction from NBS personnel at all times. * NBS requires anyone participating in these programs to have appropriate travel insurance with adequate snow cover. * Parents or guardians of any child booked into the SJTA program MUST have fully completed a registration form prior to the lesson start time. Failure to do so could result in parents or guardians not being advised in the event of an emergency. * In the event of an accident, NBS will endeavour to contact you immediately (Note: It is your responsibility to provide a contactable and working phone number) * A shuttle bus will operate between NBS, at the base of Alpen Ridge in Hirafu, and Moiwa ski resort. All students are required to be dropped off and picked up by parents or guardians from NBS at the appropriate start and finish times each day. * In the event that an injury is sustained whilst on the program, NBS will call the Ski Patrol to provide first aid. If the Ski Patrol deems the injury worthy of Hospital treatment, Ski Patrol has the right to call an ambulance without your consent. * All participants must be signed out by a parent or guardian at the conclusion of each day. * To participate in the SJTA program students must be aged 7 and above and be a minimum of level 6 in ability according to the NBS ability chart. * NBS reserves the right to merge groups of differing age and ability level. * If a child is assessed on the first morning and is deemed by the coaches not to be of level 6 standard then SkiJapan reserves the right to transfer the lesson credit to the NBS KIDS CLUB program operating in Hirafu. No credit or refund refund will be given for the difference in cost. * Ski Japan reserves the right to change the program at any time to better suit the weather/snow conditions or to better suit the children’s ability and development plan. * All SkierX and Mogul Training is subject to change based on the availability of terrain. * NBS is not able to cater to individual food requirements. Children with food allergies/special requirements who are partaking in the program need to bring their lunch. * Photographs or video may be taken of your child by NBS authorized photographers. These images may be used in public promotion or information. Cancellations by the guest as a result of bad weather will not be refunded. Only official Resort staff can declare the mountain closed. * The running of all SJTA programs is subject to a minimum of 3 students per program week. If a SJTA program is not operated due to not reaching the minimum number requirement an alternative NBS program held in Hirafu, Niseko will be provided. * Programs are offered over the course of one week consists of 6 days training (Sunday – Friday). Individual days are not available. No refunds will be provided in the event the full program week is not utilised. Children can enrol in the 1, 2, 3 or the full 4 week program or any combinations. * Cancellations by the guest as a result of bad weather will not be refunded. Only official Resort staff or NBS coaches can declare the mountain closed or unsuitable for training. * Unless booked as part of a SkiJapan.com travel package, in which their standard T&C’s will apply, a non-refundable deposit of $250 per student is required within 14 days after confirmation. Final payment is due 31 days prior to travel. For bookings made within 30 days of travel full payment is required 7 days after confirmation. Cancellation outside of 31 days will incur loss of deposit. Cancellation within 31 days will incur 100% cancellation fee.